Trip #60 – A spot of dinner! Arriving at Abbotsbury at 7 in the morning to walk the dog and find it absolutely packed meant one thing, the fish were in and the fish were mackerel. I didn’t have any rods with me at the time, but after a quick visit to Tackle UK later that day for shockleader, leads and feathers I was ready for a Mackerel bash. 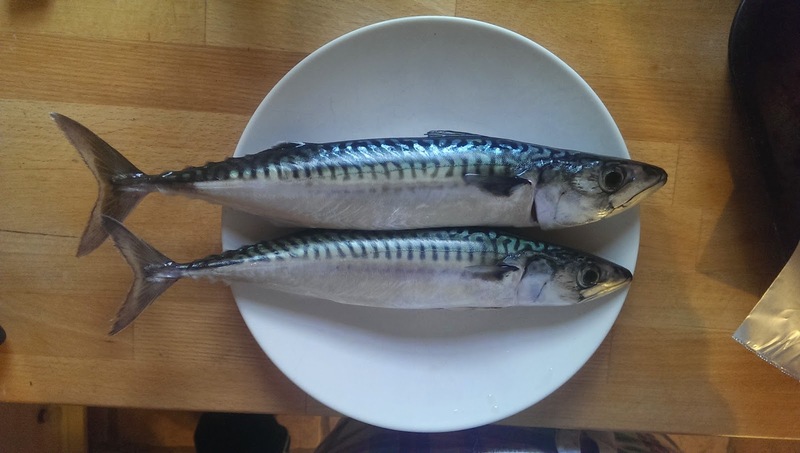 I haven’t fished for mackerel for a long time and was excited at the prospect of catching fish for the table. I had some company fishing for dinner! Watching the sea anglers cast to the horizon with 5 ounce leads and massive looking feathers, catching and bagging everything in sight made me wonder if these guys were bagging the fish simply because they had caught them – rather than actually wanting them. Also, I have never really been convinced that size 1/0 hooks (or bigger) were suitable for the job. For that reason I opted for Mustad Bait catchers on a size 6 and a 2½ ounce lead (As I couldn’t find a suitable heavy spoons to use as a weight). The next day the weather was still good, so me, the wife and the dog set off mid morning to try and catch a few for the table. It was a bit of an error to set off so late but this couldn’t be helped. 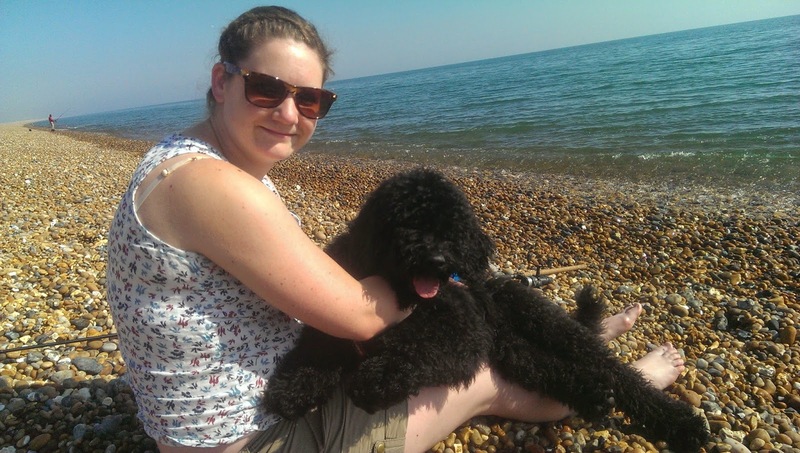 By the time we got the the beach the car park was absolutely packed. The walk to a free bit of beach was also exhausting. The pebbles are small (some are sharp) and loose and walking was a slow process and incredibly tiring (walking in trainers is an absolute must). A good 500 meters later and we had reached a free bit of beach. 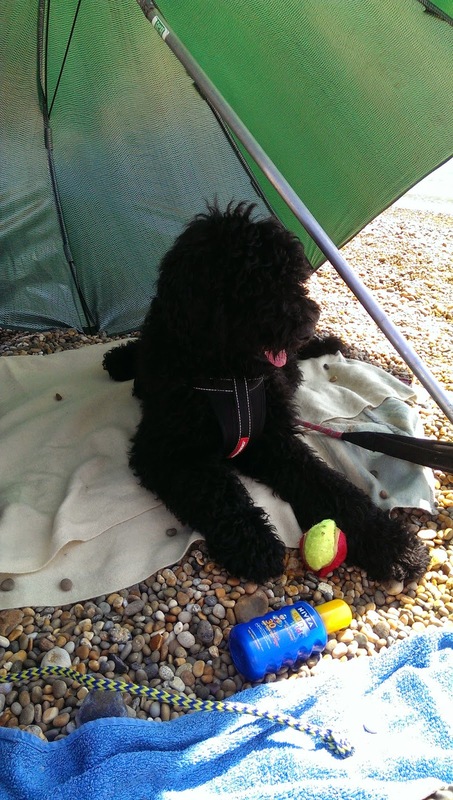 The dog was happy with the best seat under the brolly! Fortunately I had the brolly which would provide us all with some shade. I spiked it into the ground, made sure we were all sitting comfortably and then began setting up my gear. I have no beach fishing equipment in Somerset, so today I would be using an old 5010 Shimano Baitrunner reel and a 1.75 TC Barbel Rod. Setting up was an easy affair, and within minutes I was walking down to the water to start fishing. There were a few guys both to my right and left at this point, none of which were catching. I looked up and down the beach and saw 1 fish being caught on a feather half the size of the fish, and with that I waded in and cast out. 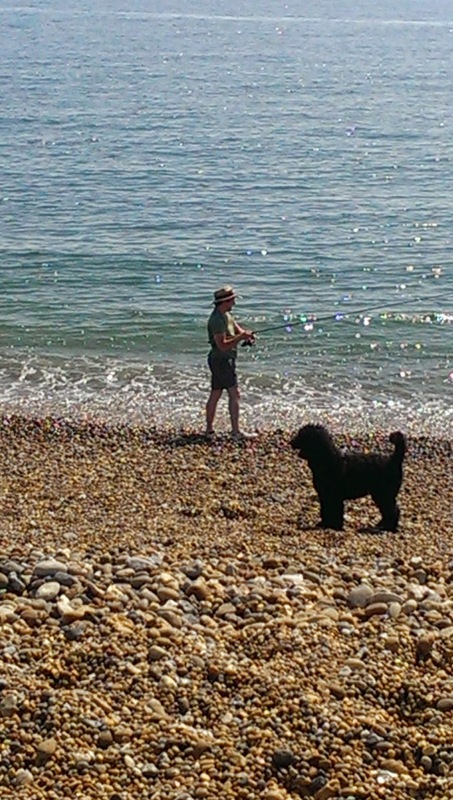 It took me 2 or 3 casts to get the line lay correct and to find a comfortable casting distance, as I had no intention of casting to France like some of the fella’s on the beach. Casting between 40 – 50 yards, seemed to be fine, and after a short drinks break I was back in the water, fishing, and winding down onto my first few fish of the session. 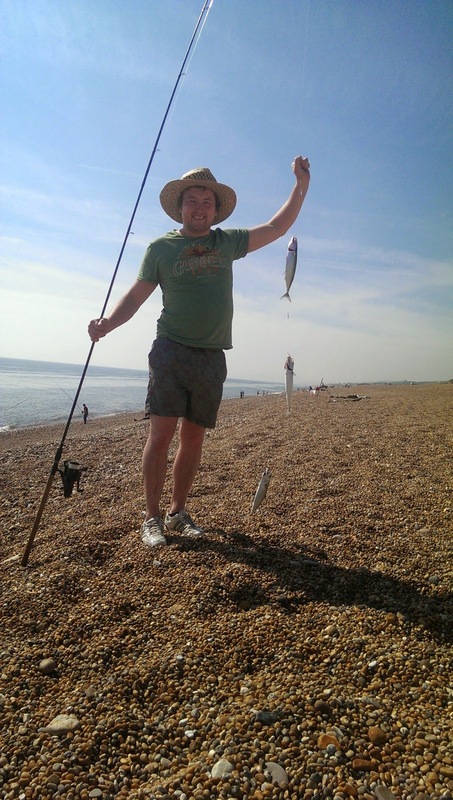 Catching multiple mackerel on relatively light gear is great fun, the rod is bent double and the fish are fighting in every direction which means bringing in more the 3 or 4 can be a bit of a tug-of-war. Still, 3 fish wasn’t a bad start, and although I was pleased to catch them, these fella’s were a bit small, so I unhooked them and slipped them back. Casting out again and I was into a few more. 2 of the 4 were keepers, so I dispatched them quickly, putting them in the cooler bag. The fish seemed to be coming in fits and starts and after a few more joeys the fishing died completely. So I stopped for a while and took a seat in the shade under the umbrella. Was nice to have some company! The next cast was much of the same with 5 fish. I decided that keeping more than 10 fish would be over the top (I planned on giving 6 to our neighbours). So a few more casts, and I had reached my limit. I continued fishing but all the fish I caught went back. I was surprised to see how few fish other people were catching when I seemed to have a few on every retrieve. Perhaps a lot can be said for hook size and casting distance. I think next time I may go light again, and try and target the fish one at a time, for more sport. Still, it was a great few hours and after a few hours sun bathing and fishing we all headed back to the car, quite happy that tonight tea was very much provided by me, and the fish don’t get much fresher than these! Our neighbours seemed very pleased too! Catch it, kill it, eat it! I can’t really rate Abbottsbury, it is a small part of the enormous Chesil beach, in beautiful surroundings. Parking wasn’t free but the fishing was. The only difficulty is the terrain underfoot. The pebbles are really difficult to walk on, and the next day my legs were aching! Still, I will definitely be going back to try and catch a few more for the table, I may even alter my approach at try for a Bass! 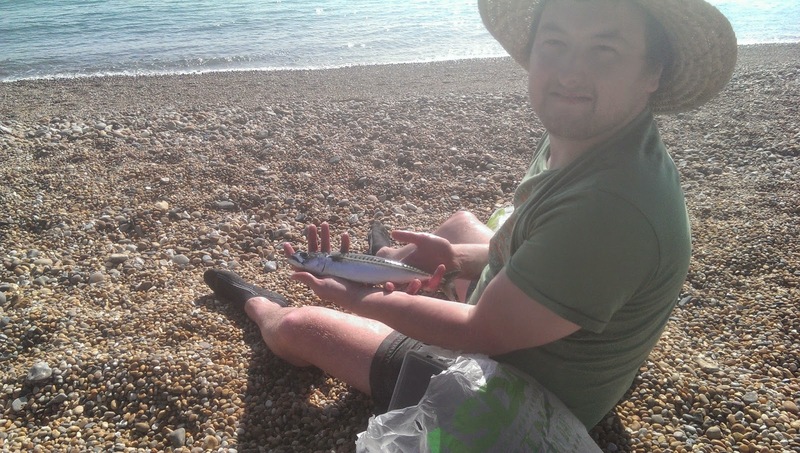 For anyone looking to catch a few fish in the summer months, I wholly recommend Abbottsbury for Mackerel fishing. It was great fun and provided great sport for a few hours! Next story Trip #61 – Dillington Pond – Take 3!